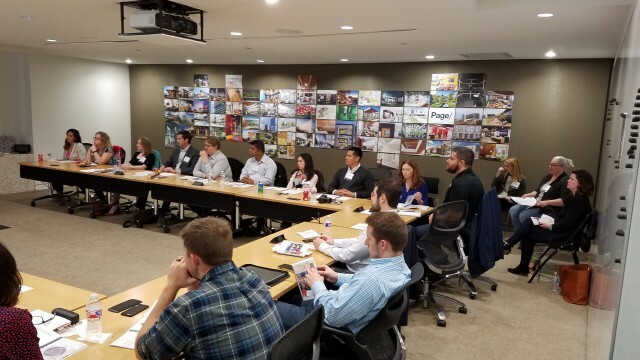 On February 10th, the 2017 AIA Dallas ELP class participated in a photoshoot for the cover of an upcoming edition of Who's Who in Building & Construction magazine! The attached story will detail the history of the ELP, and how it is transforming lives within Dallas. The shoot was comical and lighthearted, although a little windy – giving instant supermodel appeal to those in the group with flowing locks blowing in the breeze. Who knew we weren’t just aspiring architects, but budding print models as well. After an eventful photoshoot, we headed down the street to the office of Page in downtown Dallas. There we grabbed a bite to eat and Pete DeLisle, Hon. AIA Dallas led a discussion on leader effectiveness. He presented a few models that put into perspective the different characteristics of a leader. For instance, the Dynamics of Competency model showed the ability for someone to be conscious of what needs to get done, but doesn’t have the competency to achieve it. While on the other hand, someone may have the competency or knowledge to get something done, but isn’t conscious of the need for it to get done. A successful leader is one that has both the conscious to realize the need, as well as, the competency to figure a way to accomplish the need. Another model Pete used as a visual aid was the Johari window or a tool to help people better understand their relationship between themselves and others. There is the Open self or the self that is known to us and others. The Hidden self or the self that is known to us, but not others. The Blind self or the self-known to others but not to ourselves. And finally, there is the Unknown self that is known to no one; the future self. This model helped us to understand how to communicate with others and promoted personal growth through the desire to know about our blind selves. By giving and receiving constructive feedback, we are building a trust relationship with our peers and coworkers, as well as personal relationships. Pete also noted that the most important element of interpersonal skills is that you are trusted by others. Lastly, Pete went through the Farm Gate model which informs us that people need to balance their skillsets as their responsibilities increase in a company. There are 3 levels – technical, interpersonal, resource utilization- and as you take on more responsibility and oversee more people/tasks, the reliance on your technical skills decreases, as your resource utilization increases. There is a balance that happens as you grow in your career. Afterwards, we were introduced to Walt Humann, who from his long list of experience could be described as a Community Activist Extraordinaire. 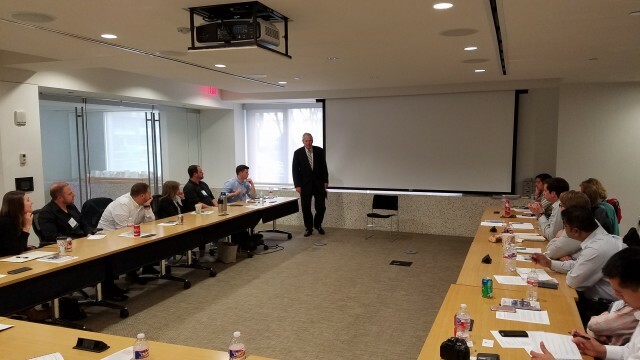 At the beginning of his presentation Walt gave us an overview of his extensive background, including a recap of his opportunity to work as a White House intern – challenging us all to some level of civic engagement. Walt is definitely a strong individual, and his perseverance and passion were inspiring. He expressed to the group how he was able to be a bridge builder between multiple parties, in an effort to get goals accomplished. He stressed the importance of gaining feedback from all parties involved, defining the big picture agenda, and seeking common ground among smaller groups based on project priority. Included among Walt’s accomplishments were successful relationships with DART and the Jubilee Community. During his presentation Walt shared an inspiring story about a young Winston Churchill being saved from nearly drowning by a boy from town. Churchill’s parents were so grateful and moved by the boy’s heroic effort that they created an anonymous fund for the young boy’s education. Years later, Churchill became very ill and subsequently received a new drug, Penicillin, that ultimately saved his life. In an event that somehow came full circle, it turned out that the young boy who saved Churchill’s life all those years ago, became the doctor that invented Penicillin. At the end of the class we reviewed a slideshow of 8-10 project ideas, and voted to narrow the list down to 4, with the task of developing the ideas further over the next few weeks and voting on our favorite option by next class. We look forward to testing the knowledge gained from Walt and Pete in our class project. And of course no Friday night after class (and long week) would be complete without some lighthearted fun, so we headed to Woolworth for a few happy hour drinks.